Sea Creature Sportfishing is a private fishing charter service operated out of The Outer Banks, North Carolina. We were approached to create a new brand for the business, and update their existing website to include modern features and design. Our solution saves the client both time and money, allowing them to focus on their business. 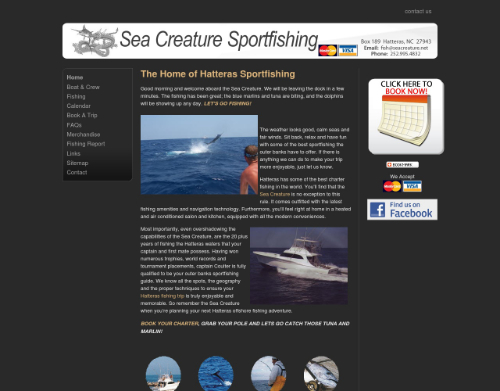 Sea Creature Sportfishing is a private fishing charter service run from Hatteras Harbor Marina in Hatteras Village, NC. 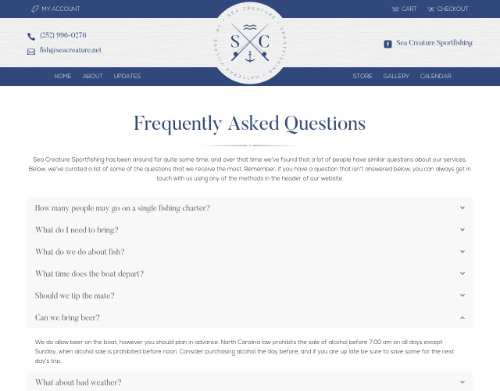 Captain Steve Coulter came to Thought Space looking for a modernized website that would allow him to easily make changes to his content while also simplifying the trip booking process for both him and his charter clients. We hooked him up with a beautiful new logo, along with a website powered by WordPress, making updates a breeze. WordPress also provided us with many options for pre-built booking calendars jam-packed with extra features. This new site has allowed Capt. Coulter to sit back and focus on his business thanks to its highly automated booking functionality. Create a new, elegant, and modern logo to serve as the base for an updated brand identity. Modernize the Sea Creature website design to make it mobile responsive, and easier to use to find information and book fishing trips. Build the website on a platform which allows for easy updates and added functionality through plugins. Incorporate a booking calendar for scheduling fishing trips directly on the website, in a secure manner. Also, make sure the calendar is easy to edit by website administrators. Create a nice online photo gallery showing pictures of past trips with happy customers. Prepare the site for adding eCommerce functionality in the future. Captain Steve Coulter already had an idea for a new logo in mind when we began working on the Sea Creature website. He introduced us to the language of cattle brands and how every symbol had a very specific meaning. One of the common symbols used in cattle branding is called a “bar”. It just so happens that the inlet where fishing boats go out to the ocean from Hatteras Village is commonly referred to as “The Bar”. After many iterations, and combining his interest in the cattle brand language applied to modern design styles, we came up with a logo that branded Sea Creature as a standout charter boat in the marina. The small wave symbol at the top of the logo relates to the double bar symbol from cattle branding. 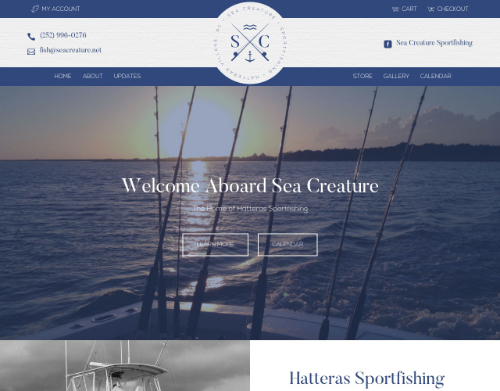 The fishing poles and anchor let viewers know right away that his business is related to fishing, while the “SC” initials personalize the whole logo to Sea Creature as well as Captain Steve Coulter. Finally, we wrapped the entire logo in a ring of text to emphasize the sport fishing industry, name of the boat, and the location the boat operates out of. To keep the logo sharp, we used a single color design that’s both clean and professional. This single color concept allows the logo to be more complex without being overbearing. 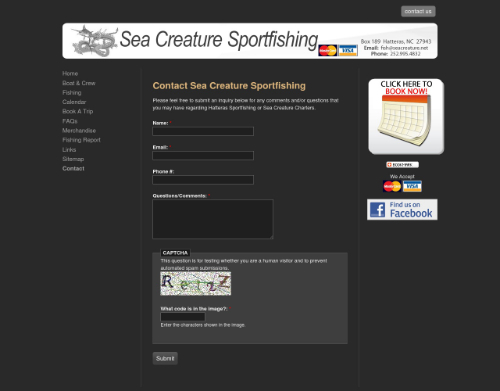 The original Sea Creature website was definitely in need of a refresh. Beyond the design of the site, it was built in such a way that Capt. Coulter had to edit HTML code on the pages to make any updates. 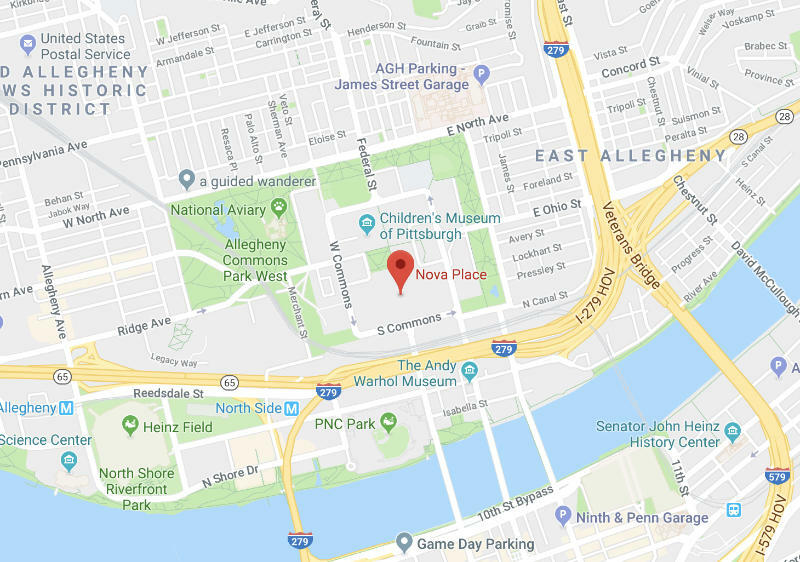 As you can imagine, making the smallest of errors in this area of the site could result in formatting, styling, and even functionality issues on the front-end of the website. This resulted in frustration, and sometimes even money spent to his old web designer in order to patch up any issues. 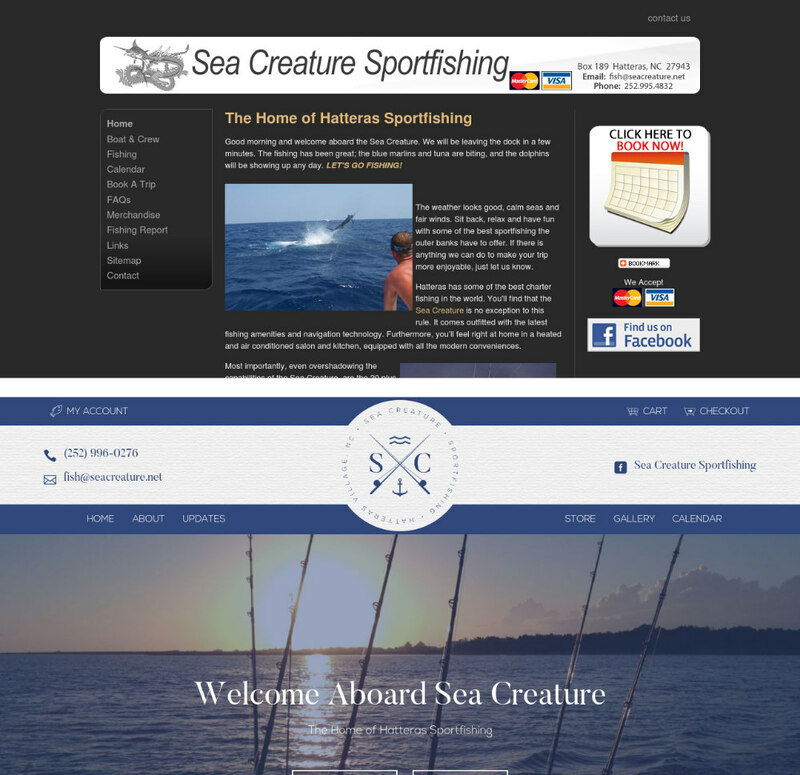 We moved the Sea Creature website onto the WordPress content management system so that Capt. Coulter could easily and safely edit the content of the website without risking accidental downtime. WordPress allowed us to provide the client with a simple means to edit pages by utilizing a third party drag-and-drop editing plugin. WordPress’ built in media library and content management functionality make updates a breeze. Ultimately, this change meant that Capt. Coulter no longer has to look at HTML code, and can comfortably make updates from a simple interface. 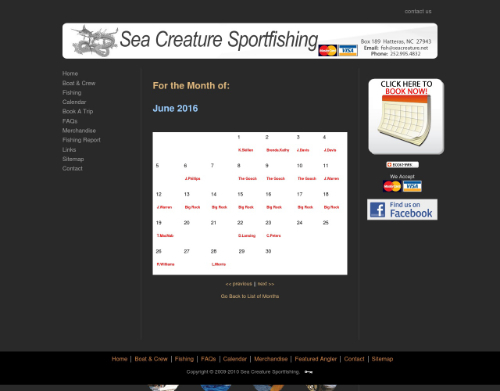 The main focus of the entire website redesign project was to make sure the Sea Creature booking calendar was updated and easy to use. The original booking calendar had to be updated by Capt. Coulter by editing HTML code. This created too many opportunities for errors to be made on the page that could render it unusable until a programmer could fix the code. To make things easier, we hooked up a WordPress booking calendar plugin with a simple to use admin dashboard so the client never has to touch source code. 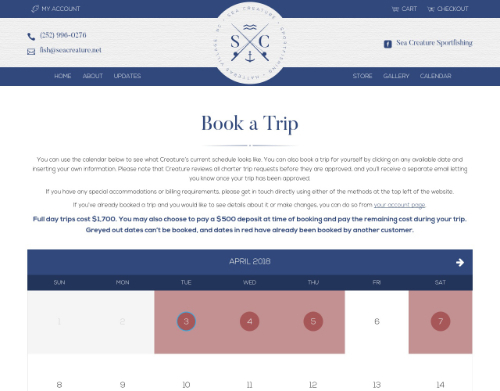 The booking calendar plugin not only allows easy updating for the client, but also helped us to save time in creating a custom solution for the site functionality. We were able to use the plugin as a base, then adjust the settings to accommodate booking fishing trips. The calendar plugin is integrated with Stripe, a secure payment processing service, that allows Capt. Coulter to accept online payments for trips at the same time someone books a trip. 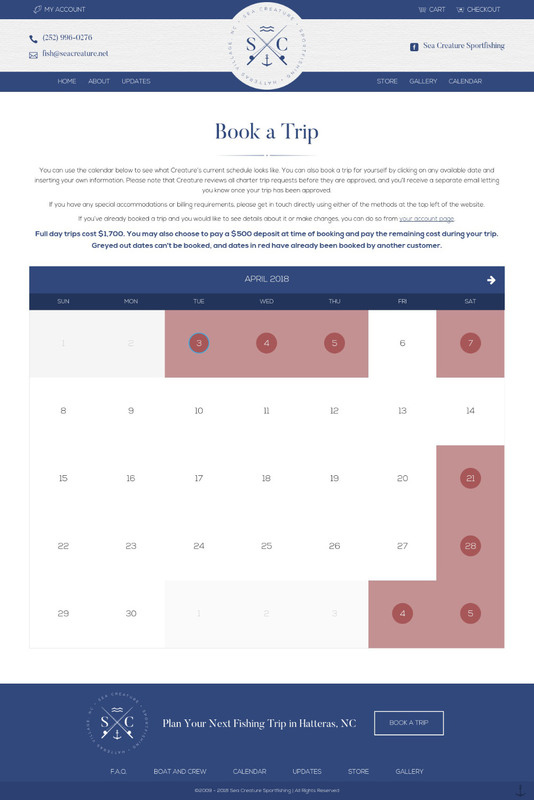 Taking it a step further, the booking calendar on the website was able to be linked up with email notifications for both administrators and clients, including trip reminders for those who have booked. It also syncs with Apple or Google calendars to make sure that the website schedule matches Capt. Coulter’s personal calendars. When a client books a new trip, it automatically shows up in Capt. Coulter’s iPhone calendar without having to manually enter any info. The finished product is efficient, adaptable, and elegantly modern. Time is Money. Our Solution Helps the Client Save Both! Anyone that runs their own business understands that time is a very vital yet limited resource. When juggling on-boarding, customer management, sales, billing, support, and more, it can feel like there simply isn’t enough time in the day to get your actual work done! This was no different for Capt. Coulter. His old website took quite a bit of time and effort on his part in order to keep his booking calendar up to date. Not only did it take a large amount of time, but it actually cost him money on more than one occasion when things broke and he had to pay his old website manager to fix things. Our solution not only brought a modern, more appealing design to the forefront of his business, but it saves him countless amounts of time and money every month. By integrating modern functionality and easy to use features, Capt. Coulter is now able to focus on fishing the ocean, rather than fishing for code bugs on his website. The solution that we created for his business was more than just an investment in his brand, it was an investment in stress reducing tools and resources that helps his business run more efficiently.